There were several days between my brother’s death and his memorial. We needed the time to assemble the family from far and wide and to let people know and to dislodge the lump which was perpetually stuck in our throats. In hindsight I feel good about the memorial we put together. I may have written about it before. Intense grief seems to produce amnesia about things for me. Anyway. The memorial was held at the funeral home in Nelson’s home town. It was the quintesential small southern town funeral home. In other words, men in suits and southern accents who probably expected things to be done a ‘certain’ way. We were most definitely not the ‘certain way’. We brought in a projector and a macbook and a huge screen and John Moreland music. We brought in a 10 gallon bucket and straw hats and guitars. We created a busking spot a-la Nelson style at the front of our designated room. The memorial service itself was comprised of three slideshows set to music – good music; intersperced by addresses from each of Nelson’s siblings and an open mic portion for anyone who wanted to speak. It was moving and it felt like Nelson and I wish he could have known that the place was packed, every overflow room utilized and that he was greatly missed and mourned. I suppose I took the lead with the planning of the memorial. The highschool version of me that had perfected procrastination has long ago been banished and the replacement version of me overplans and works voraciously to meet deadlines and exceed expectations. The memorial was no exception. I slept very little that first week as I culled together hundreds of images of Nelson and arranged and rearranged slideshows so that they held a theme or complimented the music. I rehearsed their execution and left absolute nothing to chance. I wrote my remarks for the memorial after thinking for days about what I wanted to say and throwing away several drafts that proved inadequate. I made a photobook for my son that included hundred of pictures of Nelson with his uncle Nelson and had it printed in hardback book format and delivered prior to the memorial. I was exhausted but I was determined to treat the occasion with the respect it deserved. I wanted very much, to do right by Nelson. In so many ways he didn’t treat himself well and I wanted to offer the counter balance to that by honoring his memory with care and attention to all the details. Many people commented about the amount of work I had done in those few short days. They remarked about it as if it was somehow unusual or implausible that I would be able to do such a thing in the midst of the tragedy. I must admit I was somewhat bewildered that others weren’t attacking the planning with the same gusto. It was such a comfort to me to be so immersed in the music my brother loved while pouring over images of him. It was good for me to journey through my memories looking at the pictures and organizing and chronicling them. I felt like it was keeping my brain moving and my thoughts revolving around Nelson in a way that, while sad, also gave me great comfort. I felt compelled to work on the memorial. It gave me somewhere to place my grief. And then it was over. And there was a strong sensation of now what? We almost immediately went to Portland and then we were back and off to the beach for a few days with friends but then we were home and it was too quiet and I didn’t have a memorial to plan and I didn’t know what to do with myself. It was such a dark time. I felt like I cried so much and the future seemed so bleak. At some point during this time my friend Chris remarked that I didn’t seem to have any defense mechanisms to help me deal with the grief. He pointed out that I seemed to stay in a perpetually raw state. I remember thinking at the time ‘why would I want any defense mechanisms?’ I needed, wanted to feel the sadness. My brother was so important to me. I didn’t want to defend myself against the loss. I wanted to sit with it and hope that maybe it would swallow me up and that would just be the end of it all. But it didn’t work that way. I was just adrift with my pain. And it wasn’t good. I worried that I might really lose myself. I was having dark thoughts. Very dark thoughts. I didn’t know if it was normal but I was very overwhelmed. And that dark, overwhelming sensation was also static. Day after day I would wake up and burst into tears. I would cry off and on all day long and ended each day sobbing into my pillow. I wasn’t able to articulate it then but I needed a place to put the energy of my grief. Planning the memorial had given me that but it was temporary. While we were in Portland Judd found a painted rock at the Japanese Gardens. It had a positive message painted on it. When we got home I found two more rocks at Target of all places. It got me thinking. I took a trip to Michaels to buy paints and brushes and I started gathering rocks. 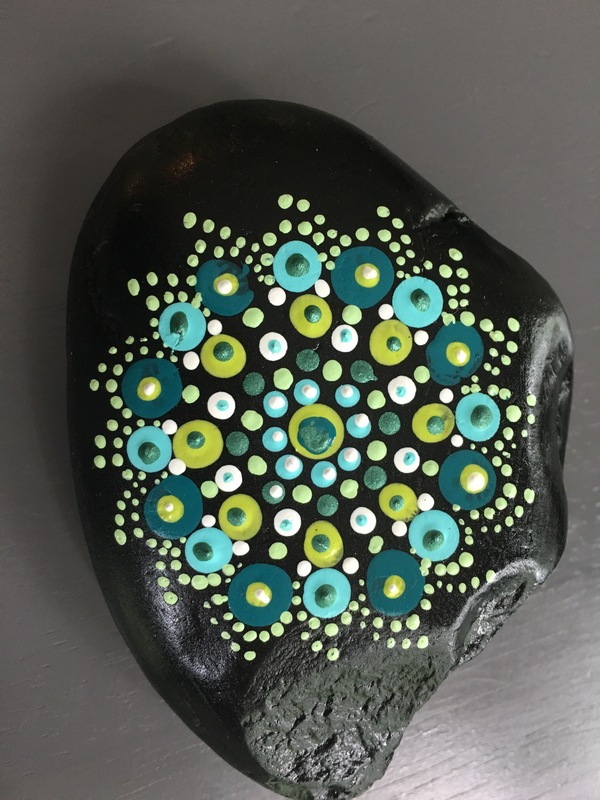 I had actually had the idea of painting rocks germinate in Portland and I picked up a couple rocks from Portland and brought them home. I decided I would make my brother a rock garden in my backyard. 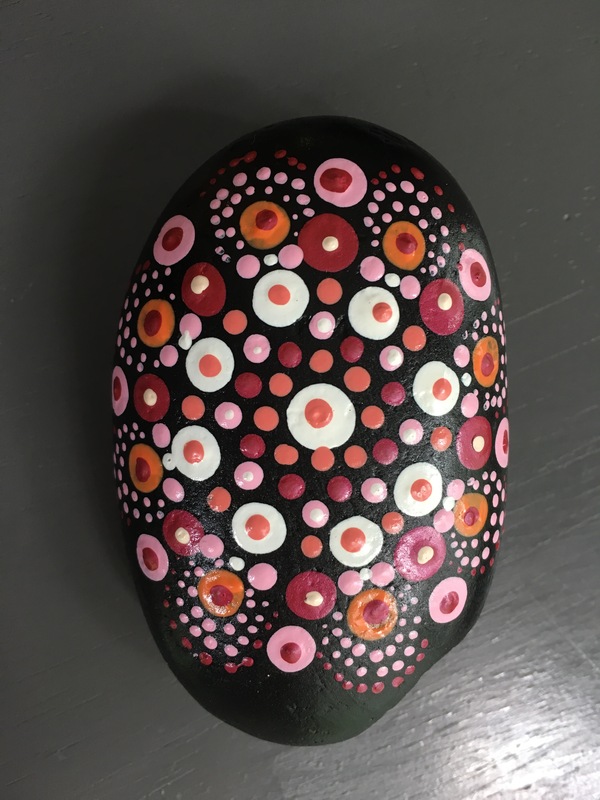 The first rock I painted was big and I painted small dots all over it. It wasn’t very creative or artistic but it was tedious and it took hours of concentration. It was the sort of concentration that requires you to focus on what you’re doing but with room for thoughts to move about which was the magical combination I apparently needed. What happened next has felt like a miracle to me. I started painting rocks – badly and with little vision but while I was doing it I wasn’t crying; usually. 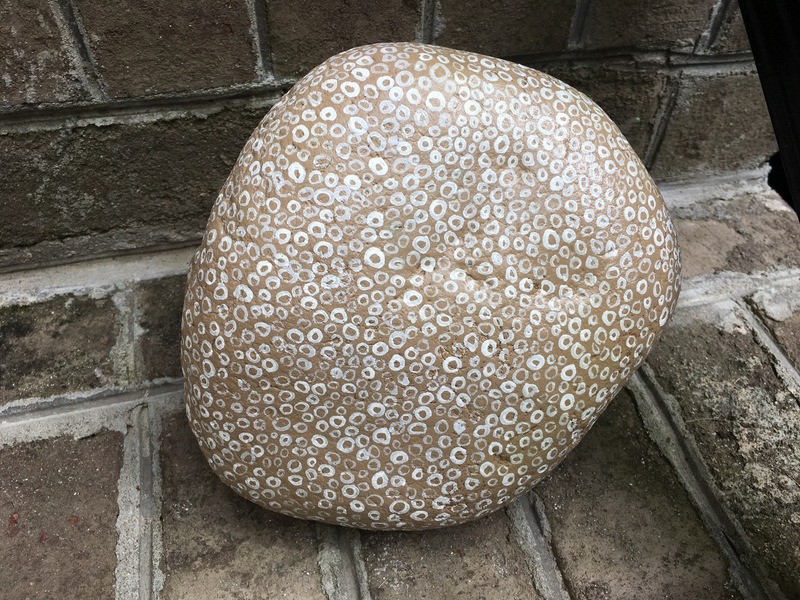 I started to look at rocks other people had painted to give me inspiration (direction) and I discovered Mandala stones which I thought were extremly beautiful. I tried in vain to create one myself. Mine were so sloppy and horrible I often painted over them and started over. It wasn’t rocket science but I was making something and I was using my brain. I was practicing being focused again. It felt medatative in some strange way. All this painting necessitated the buying of more supplies. And on one of the trips to buy more paint or some such thing I wandered the aisles of the store and found something called ‘artist tiles’. It was nothing more than a small pad of black paper squares. 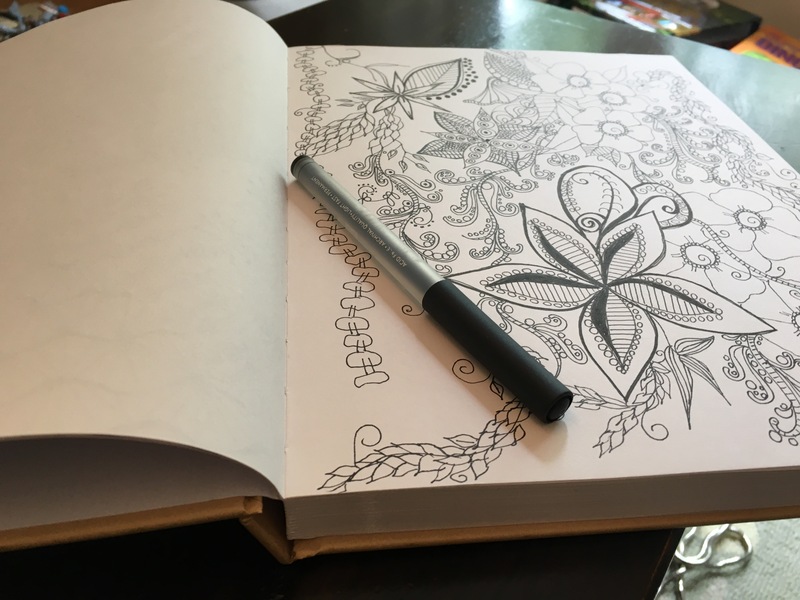 On the cover was an illustration of a doodle done in white ink. Hey, that’s neat, I thought to myself. I should try that. 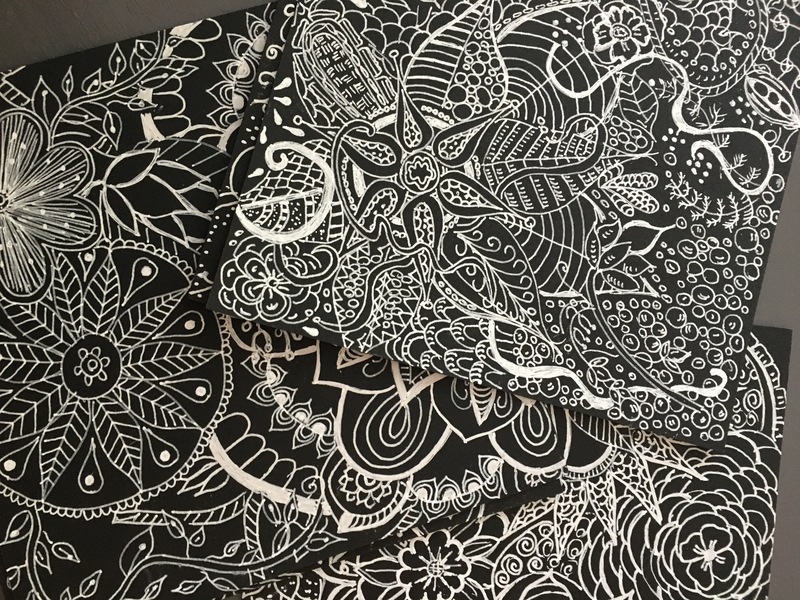 And so I bought a pad of artist tiles and a pen with white ink. 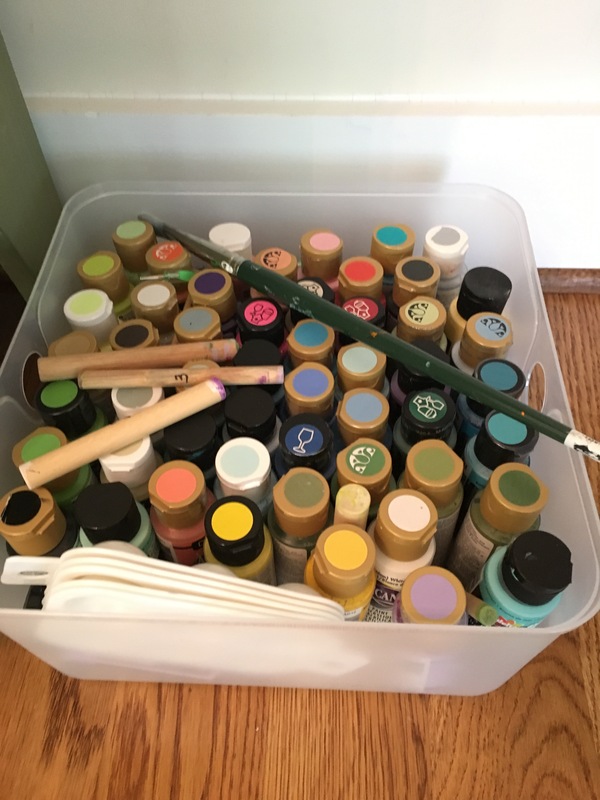 I felt pretty unencumbered to sit down with a piece of paper and pen when I had become adjusted to paint bottles and brushes and cups of water and rocks and paper towels and lots of prep and even more clean up. I don’t know what I was hoping to do. I just wanted to try to draw something with white ink on black paper. I simultaneously bought new colored brush pens and a couple books on hand lettering. I was on some creative high. The hand lettering, while very appealing to me, didn’t catch fire. Not yet. I tried it and realized my mind wasn’t able to take on the task of learning this skill. I put the books and pens in my closet. But I put the artist tiles and the pen on my kitchen table. And I went back to mostly crying all day. One day, while crying I picked up the pen and drew a flower on one of the black paper tiles. It didn’t look half bad. 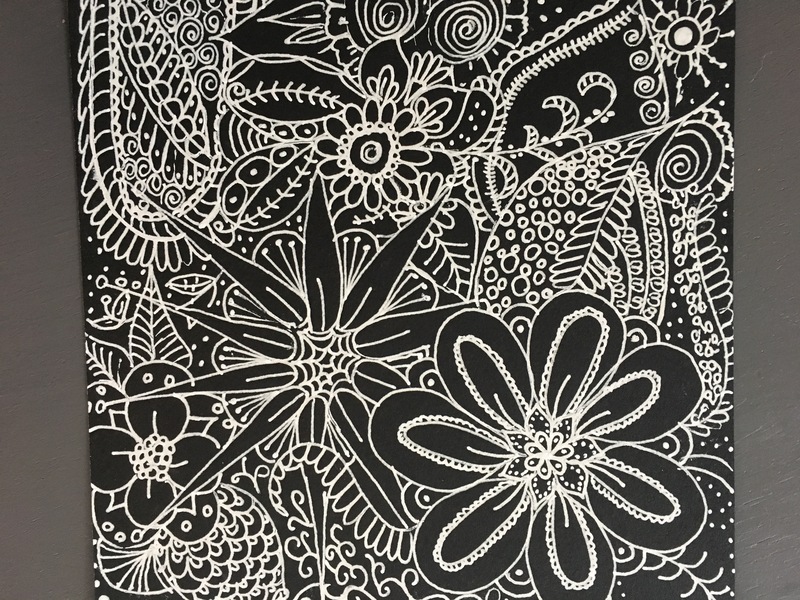 I think most of the credit goes to the fact that it’s white ink on a black background but I liked it and I drew another flower next to it and then another and then another. Before I knew it, I had made a drawing. I had made a drawing! I made another. I kind of liked them. I surprised myself. I was drawing flowers and thinking about Nelson and it was focused and it was comforting. And then I drew more. And then I drew so many that I bought a box to put them all in. I began to realize that at some point I might look in this box and think about where my life and heart were when I was doing these drawings. I tried not to care if they were good or not. They were quite definitely medicinal for me. But Judd told me they were good. He made me feel so good about them. He made me feel artistic. Never would I have identified myself as artistic. Can trauma make turn you into an artistic person? I tried painting Mandala stones again and finally they started to look better; not great perhaps but better. It was a new experience for me to create something and feel that it looked good. How emotionally rewarding. 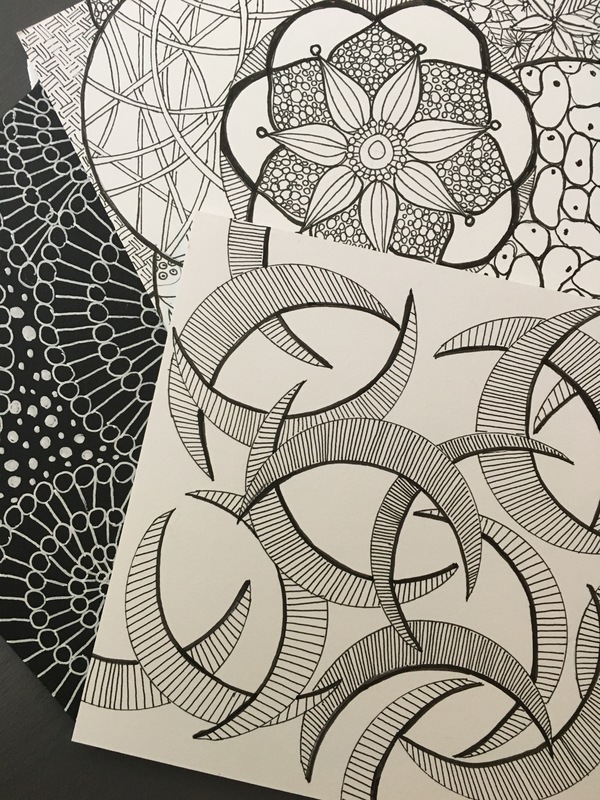 I own a lot of supplies now and I worry a bit that all this desire to create may come to a screetching halt particularily when the rigors of the real world, paying job and school work come pressing in. But for now, I am drawing and painting and grieving for my very precious brother.